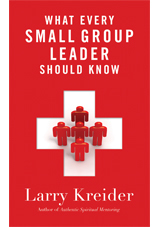 As a small group leader for many years, Larry Kreider writes, “I am completely convinced that if God can use me, He can use anyone!” He believes that everyone-including you-has untapped leadership potential and that unleashing those abilities is just a matter of equipment and motivation. What Every Small Group Leader Should Know has plenty of both! This will become an indispensable handbook as you discover the unique ways God has gifted you to serve ….for serving is exactly what great leaders do. At the heart of What Every Small Group Leader Should Know is a big-picture vision of biblical service. Jesus said that whoever wants to be great in His kingdom must become a servant, and it’s that passion for meeting others’ needs that is the difference between ho-hum leadership and effective, thriving leaders.